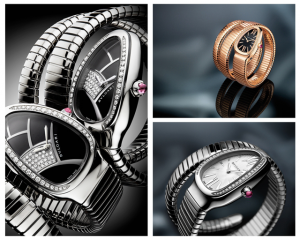 When it comes to Bvlgari, the Serpenti collection will come into our minds. The Serpent-themed jewelry, wristwatch and other accessories all make a hit and sell well. Bvlgari never stops to use more excellent craftsmanship and cherish materials with the serpent-themed element to create the unique Serpenti watch. Among so many famous watch brands, why do famous female stars select the Serpenti wristwatches? First, a serpent represents wisdom, vitality and seduction. Second, the Serpenti watch is not only a wristwatch but also a jewelry bracelet, standing out wearers’ good taste and powerful charm. A serpent totem as the root of charm has existed since ancient age. With a mysterious trait, a serpent appeared in fairy tales or folk tradition stories of any country of the whole world. In Ancient Greece, Asclepius was considered as God of Healing who held a sceptre with two serpents. People believe serpent means rebirth, healing and mysterious power. 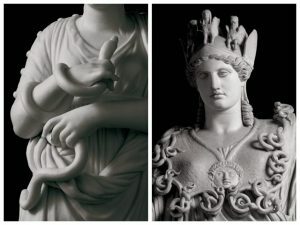 Besides, with the development of Roman culture, serpent totem became an important element in designing jewelry. Since 1940, Bvlgari collection has been inspired by the serpent. Bvlgari inherits the classic theme and creates infinite possibilities. 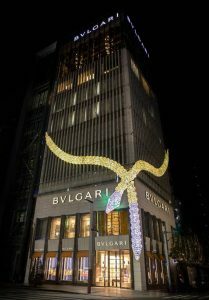 There is no doubt that the serpent plays an important role in the development of Bvlgari. Elizabeth Taylor commissioned Bvlgari to design and produce a Serpenti bracelet in the 1960s. The 18K gold Serpenti bracelet inserted with a jade, rubies and diamonds was finished in 1968. With a jade serpent head and a tubogas body with diamonds, the Serpenti bracelet was worn on her wrist in the film Cleopatra, attractive. 1. The first Serpenti Tubogas watch with a champagne dial made in 1949 looks still avant-garde now. 2. By the 1970s, the Serpenti Tubogas watch began to transform to the more avant-garde style. The shape of the serpent head is available in round, square, octangle, pear-shaped and cushion-shaped. The watch case was set in the middle position or at the either end of the bracelet. There are more bracelets in steel, PVD steel, yellow gold and gold and steel version available. The watch in the picture below was made in 1972. 3. The Serpenti watch fused B.zero1 and serpent themes to show simple but modern style. The 18K gold edition made in 1994 is priced for $ 12,000. 4. To 2011, more precious metals, diamonds and mother-of -pearl were used. 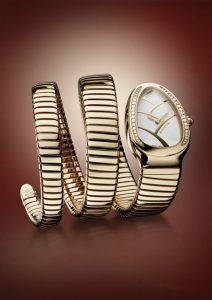 To people’s surprise, the Serpenti Tubogas Seven spiral watch was launched, even such a bracelet was 35 meters long. 5. In 2015, the Serpenti Tubogas Double spiral special edition watch in Rose gold was limited to 30 pieces in China, including Hongkong, Taiwan and Macao. The watch features a crown set with an egg-shaped pink tourmaline. 6. In 2017, the Serpenti Tobugas watch brought more surprises to the public. Steel edition, steel and rose gold edition with black dial. 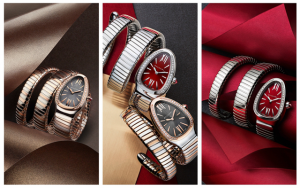 The double spiral steel version with burgundy red dial. The single/double spiral steel and rose edition with slate grey dial. Two of the most amazing models are the five spiral version and the seven spiral watch. 7. The 2018’s edition fused white gold, rose gold and yellow gold, delicate and luxury. Smooth and charming Tubogas bracelet. An crown set with an egg-shaped pink tourmaline boasts delicate and elegant charm.